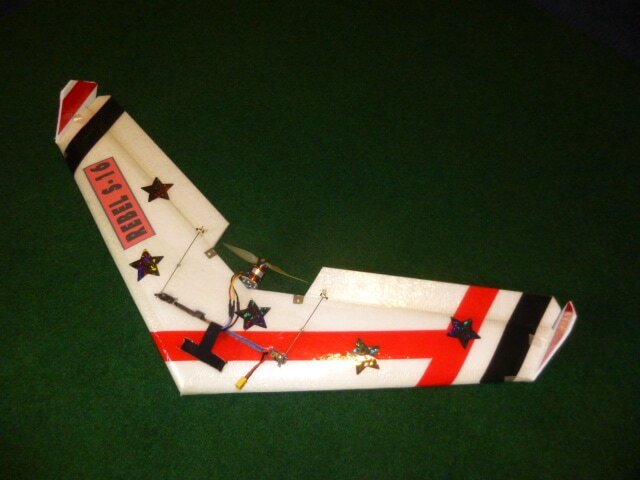 ​40" Class FPV Racing, Ballistic Speeds. The drop down price includes plane and shipping. ​The CTH Rebels are exciting symmetrical airfoil 40" flying wings for sport flying and FPV racing and ballistic speeds. They are available with 12%, 14% and 16% airfoils. When you buy 5 and get one free at CTH !!! All kits include hardware and free laminate!!! Are you confused with too many choices? Don't be. If you are after a great flying symmetrical airfoil on a multi purpose flying wing order the Rebel S-16 first. It is the toughest and a fantastic flyer with lots of room for batteries and radio. If you need a thinner airfoil, we have planes for you too. See more videos at bottom of page. The CTH Rebels are symmetrical airfoil 40" flying wings designed for sport flying and FPV racing and ballistic speeds. The Rebels fly fantastic with CG back 6.5", very little reflex and you need to bend the mount a little to get a 0 degree motor angle. All three planes are flying at 20 oz to 21 oz with the same motor and batteries. We did add one ounce of lead to the nose of the S-12 for balance at CG. Follow the Widowmaker build videos for the Rebel S-12 and the Assassin instructions for the Rebel S-14 and Rebel S-16. Are you confused with too many choices? Don't be. If you don't have specific reason to get one of the Rebel wings and just want to get a great plane, order the Rebel S-16. 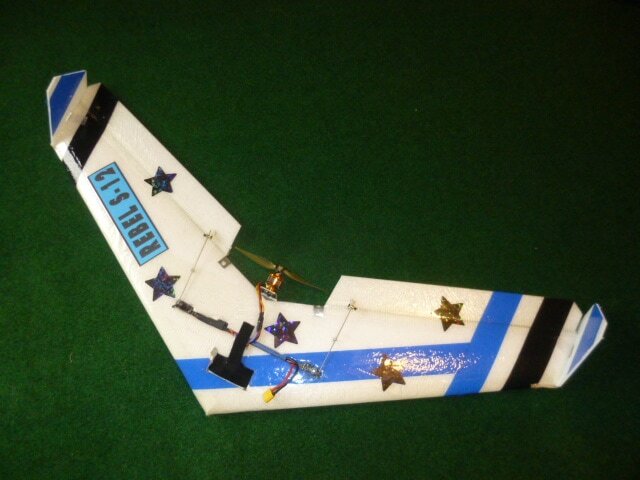 It is the toughest and a great flyer with lots of room for batteries and radio. The variations in thickness all come at customer request. The Rebel S-12 is 1-1/8" thick. The Rebel S-14 is 1-3/8" thick and Rebel S-16 is 1-5/8" thick. We have a Rebel with a S-12% symmetrical airfoil for speed and penetration which is a great set up for high speed racing. It also has lower drag and flies well on the slope. We have the Rebel S-14% that is thick enough for bigger 4S batteries and is thick enough to stand the batteries on their edge which protects them in an accident but still thin enough for high speed. It is one of our more popular designs. We have the Rebel S-16% that is as thick and tough as the Assassin and built like an Assassin making it another one of the toughest planes on the planet sold by Crashtesthobby. It is thick enough to stand a 1300 3S-4S battery on its edge to better protect the battery and radio when smashing trees and brick walls. In "The 3 Rebel" video we chose inexpensive 2812-1534 kv motors with 1300 mA 11.1V 3S batteries that have a prop speed of about 70 mph for airfoil performance comparisons. 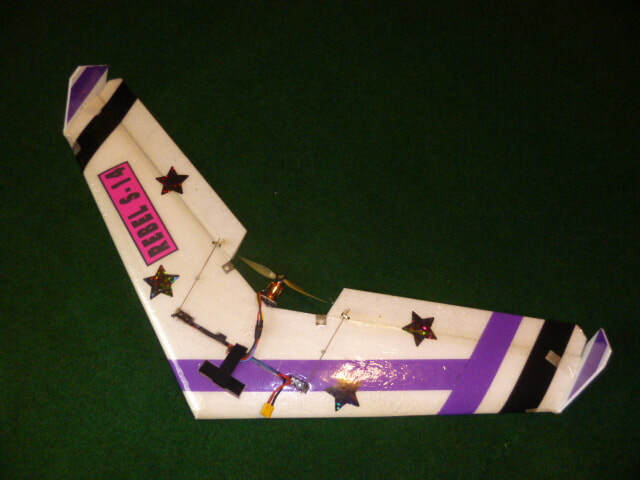 Many flyers increase the motor size and go to 4 S batteries to get speeds over 100 mph. Higher KV motors and higher battery voltages will significantly increase speeds. Even with this smaller motor we were amazed with the agility and vertical performance. You are going to love these planes!!! Rebels are designed to be great club racers because we have kept the price low and the quality high!!! We have designed the the Rebel series flying wings to have the lowest shipping cost for our international customers. We also wanted to keep the price for the kit at the $49.95 including the laminate. We wanted to show they could use inexpensive radios and electronics as I demonstrated in the 3 Rebels video with a $45.00 Flysky i6 transmitter- receiver $6 servos, an $8 motor, and $12 ESC, and still have great maneuverability and performance at 21 oz AUW. Watch the Brick Wall Video on our homepage and see the Assassin hit a brick wall at full throttle several times in a row and keep on flying. The Rebels are just as tough because they are built the same with the same construction techniques and materials. The Assassin in the Brick Wall video is still flying without any repairs. The wing cores and elevons are cut from 100% EPP foam and reinforced with a flat carbon spar, extreme tape, shock cord and laminate. The battery and radio are mounted deep in the EPP foam wing which acts as a shock absorber to protect them. The Rebels will bounce off pavement and make brutal hard hits during combat and keep on flying. When built light with a flying weight (AUW) of around 21 oz it will go straight up and has a flight speed of about 25-75 mph with the recommended inexpensive motor and 3S battery. If you upgrade to a 4S battery and a bigger motor you can get speeds of over 100+ MPH. We have designed the Rebels to fly with a large prop and lower RPM to make them quieter and a little more neighbor friendly. Please log in and join the discussion at: RCGroups.com "Assassin Vs Widowmaker - Toughest Plane on the Planet"